Count on Original HP Toner cartridges with JetIntelligence to deliver consistent quality at fast speeds, plus affordable high-yield options and anti-fraud technology to help ensure results you expect—something the competition can’t match. 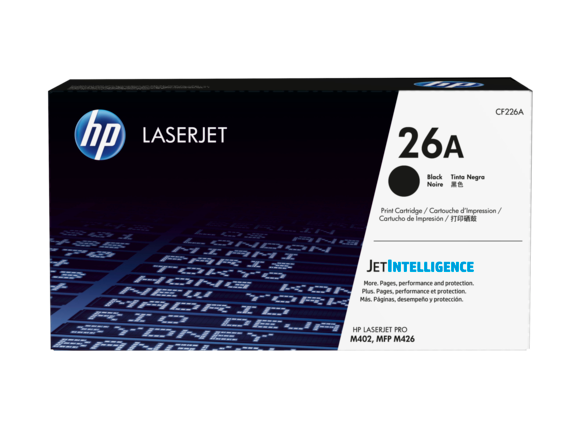 HP 26A Black LaserJet Toner Cartridge. Print for longer than ever before—get 30% more pages per optional high-yield cartridge. Original HP Toner cartridges with JetIntelligence help you get the most out of your printer—professional documents you can proud of, more pages at fast speeds,1 affordable high-yield options2 and anti-fraud technology. Produce consistent, quality documents at speeds your HP printer or MFP was built to achieve. Original HP Toner cartridges with JetIntelligence are engineered to match your printer’s high-speed performance and deliver results. Choose toner cartridges that help your HP printer or MFP work its best—Original HP Toner cartridges with JetIntelligence match the fast performance of your printer to help deliver consistent results.